Water pH is one of the most important parameters to consider when testing a pond. A pH that is too low or too high will affect the health of the fish and plants! Ornamental fish such as Goldfish can take a little variation in pH, but they prefer the water to be a neutral (neither acidic nor base) pH. Water Changes Can Damage the Pond Ecosystem if Not Done Correctly. Know the pH of the water you are adding Not only do the fish prefer a neutral pH, but ammonia toxicity depends on the pH of your pond's water as well. More toxic ammonia is present in pH ranges above 7.0 than below. 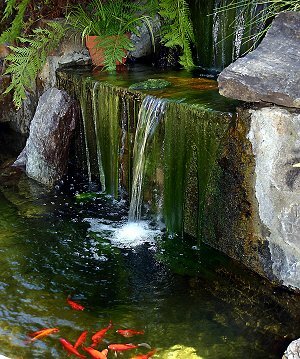 Even if your pond has a low pH and low level of toxic ammonia before a water change, if you add high pH water you can instantly change the ammonia that was present to a toxic form and damage fish and plants. Therefore, each time you add or change water, it is a good idea to measure the ammonia level and treat accordingly or treat prophylactically every time with a product such as Ammonia Detox. Since many water departments are now increasing pH, it is necessary, in many cases, to lower pH to provide a safe environment for the fish and plants. How difficult it is to lower the pH a given amount is dependent on the alkalinity (or buffering capacity) of the tap water. Too much suspended calcium carbonate or other basic materials just "drink up" your pH lowering chemicals. The leaching of alkaline materials from concrete ponds may also contribute to the problem. Some tap water systems or municipalities suffer a low pH (below 7.0). In those areas where alkalinity is already low it is easy to just top-off your pond and go. In other areas, the alkalinity is extremely high, and excessive amounts of pH adjusting chemicals may be required. Start Adjusting pH With Small Amounts of Chemicals. It is prudent to start off using a small amount of pH adjusting products at first. Adjust the pH multiple times, if necessary, to determine the amount required to lower the pH of your particular water to the proper value. Further experience will be required to determine when additions will be necessary to maintain the proper value. "pH bounce" is the effect of treating your water, lowering the pH to the appropriate level and then, upon later testing, finding that the pH is again too high. It has "bounced" back up. In highly alkaline waters (indicated by pH "bounce"), the alkalinity will be lowered with each addition of product, so that less will be required on each addition to cause the same pH drop. Concrete Ponds or Decorations Can Raise the pH. If the pond is new, and concrete and alkaline rocks have been used, several changes of water will be necessary, and some ageing (i.e. allowing some algae and sediment to cover the exposed alkaline materials to slow their leaching into the pond) will be required to get the pH under control. Pond Water pH Tends To Fall Over Time. Pond pH may also degrade over time, becoming more and more acid as the organic activity gets established. If pond pH is too low, fish and plants will suffer, although, plants may die in water due to low pH when fish continue to live in it. If your pond continues to drop and drop, try adding calcium carbonate decorative rocks or gravel to bring the pH up naturally. It is a good practice to measure pH weekly on new ponds and semi-monthly on established ones. Never change pH more than .2 pH per day! Maintain accurate records.